If victory today depends on sustained innovation, then our lack of cognitive diversity and our default/counterproductive biases will continue to be the primary obstacle (rock in the road) to designing and implementing a new, winning strategy. Our counterproductive biases are the No. 1 business challenge from which all other business challenges are born. Bias is a 21st century business issue, not a diversity issue. Are we doomed? What if we’re working for zombie leaders who are trapped by their biases? What if we’re the zombie leader? Is there an antidote that we can use to keep from becoming “walkers” ourselves? Like the “Rock in the Road” episode from Season 7 of the Walking Dead when Rick Grimes tells a story about a rock in the road that nobody removes, it keeps causing all kinds of problems until finally a young girl digs it out. The moral of the story is: Whoever has the perseverance, decency and determination to dig up the rock in the road, gets the gold reward. It has a nice “better angels of our nature” storyline. But let’s not go there; that’s distracting. Let’s not attach this business antidote to a fictitious storyline or moral, intuitional, spiritual, anecdotal truism. Let’s not bring it up in the context of L&D, HR or gender, diversity and inclusion (none of which historically have had enough corporate authority or decision rights to drive meaningful change). That’ll just give us a reason to minimize the impact. Let’s not even attach the antidote to a legal argument. Let’s stay in the realm of objective reasoning and business logic. Let’s work within our reliability-oriented, overachiever, operational mindsets from the industrial age, where delivering business results is what matters. In business, we’re taught to “put up (the numbers) or shut up.” I’m cool with that. So let’s talk about this in the context of irrefutable evidence, observable math and real-world experiments that prove, without a doubt, exactly what to do for better business outcomes. In our 21st century reality, we’ve been walking around our “rock in the road” for decades. Whether it is explicit or implicit (conscious or unconscious) biases, Drucker warns us that in times of change, the greatest danger to complex problem solving and effective decision-making is our tendency to act (unconsciously) with yesterday’s logic, beliefs and mental models (aka the leadership complexity gap). But we’re all so smart and so successful that we can’t imagine that Drucker was talking about us — that other executive over there for sure…he is a classic example of being a prisoner of thought patterns, but not me…no way. The reality is that no one is immune. Our brains are always applying default biases and rules that are both productive and counterproductive whether we consciously know it or not. We’re biased about the biases that are counterproductive. We have HUGE blind spots and amazing powers of denial. We all have biases. The problem isn’t that we have biases; the problem is that we deny that we have biases. I don’t do any of that. This doesn’t apply to me. I’m not biased. If I am biased, it’s only a little, and I do not suffer from cognitive biases. I am not drawn to details that confirm my beliefs (confirmation bias and bandwagon effect). I don’t notice flaws in others more easily than I do in myself (bias blind spot). I don’t fill in characteristics from stereotypes, generalities and prior history (fundamental attribution error, negativity bias). I don’t preference people I’m familiar with or fond of as better than others (in-group and out-group bias). I don’t simplify probabilities and numbers to make them easier to think about (normalcy bias, gambler’s fallacy, neglecting probability bias). I don’t assume I know what other people are thinking. I don’t infer what others’ intentions are (illusion of transparency, projection bias). I don’t project my mindset and assumptions onto the past and future (self-consistency bias). I don’t favor the immediate, relatable thing in front of me over the unknown future thing (hyperbolic discounting). I don’t avoid making irreversible decisions or making mistakes because I’m trying to preserve autonomy and group status (status quo bias). I don’t have a tendency to disproportionately advocate for or focus on things I’ve invested time and energy into (sunk cost bias). You might think, “I get it, and I am humble enough to realize that, yes, I can make mistakes. Got it.” No, NO, NOOO. The point is that I/we do not/cannot appreciate the extent to which I/we have error-prone thinking patterns (biases), as evidenced by the near century of data (and neuroscience) illustrated in this beautiful graphic on the 200+ biases that our limited minds and egos can’t seem to comprehend. That’s part of the problem. Most successful, smart senior executives “know” this on an intellectual level. We “know” too much, actually. We’re stuck in the knower mindset versus the learner mindset. Apparently, we don’t “know it” in a way that we’ve been able to consciously choose to do the things it takes to mitigate these biases when it matters most. Our biases from the industrial age have us trapped and make us unwilling to effectively change our corporate lifestyles/habits quickly enough to walk our talk when it comes to “leading differently.” Against Drucker’s warning, we have not prepared ourselves to lead more effectively in the networked age. In most cases, we are far behind where we should be. We need to drop everything and train on deliberate, focused lifestyle practices that help with readying ourselves to pursue a new master plan. Now is not the time to be defensive nor waste valuable time and energy enabling professionals who still choose to deny their own biases. Let’s get to the antidote — the best way to mitigate the limitations of our own brains. While taking a University of Michigan massive open online course (MOOC) on Model Thinking and Understanding Complexity, I came across Scott E. Page, a famous social scientist, professor of economics, director of the Center for the Study of Complex Systems and author. He is best known for his research on path dependence, culture, collective wisdom, adaptation and computational models on how human beings work together. In his decade-old book, Page reveals the winning formula that every business professional can embrace as fact…the absolute fact…the undeniable mathematical rules…the gold prize under the rock in the road…the Diversity Prediction Theorem. Companies that love the reliability of math, algorithms and big data, like Google, Netflix etc., have been putting the formula to work to improve predictions about the future, modeling consumer behavior and addressing previously unsolvable business challenges. The formula proves to be true, beyond any doubt. No assumptions have to be made. No conditions have to be considered. It’s just a mathematical fact. The math shows that the Crowd’s Error is the Average Error minus the Diversity. Said differently, our team’s accuracy is driven by individual’s accuracy plus the team’s diversity. Individuals make decisions/predictions based on models (e.g., mental models, math models); therefore, the more models/perspectives that we use, the more accurate our decisions/predictions will be. This is a very important concept, as it shows that optimal outcomes are attained with more diverse perspectives. Question: How can a group attain more diverse options to choose from and therefore better potential responses to challenges and circumstances? In the networked age of the Fourth Industrial Revolution, VUCA is the norm. Global markets, interconnectedness, digital transformation, complexity and exponential change drive the need for expanded capabilities. Corporations in all industries are transforming themselves in pursuit of greater advantage from specific competencies and cultural attributes (i.e., collaboration, innovation, agility, building high-performance teams, attracting, hiring and retaining the best talent). Where leadership and culture transformation is concerned, the unit of work is dialogue. Problem solving and decision-making are the highest value products of professionals. Not “probably” matters — cognitive diversity ALWAYS matters. So when leadership transformation programs, immunity to change programs and/or gender, diversity and inclusion programs that are intended to address bias and shift mindsets are bolted on like an elective course versus integrated into business strategy, you continue to see the disconnect between biased behavior and what is in the best interests of the business. Investors, leaders and boards of directors who ignore this fact are enabling their organizations to continue to walk around the rock in the road. That seems negligent and unprofessional, like the childish ostrich effect (cognitive bias) in behavioral finance, which is the attempt made by investors to avoid risky financial situations by pretending they do not exist. The awakened market won’t let childish leaders/bystanders get away with that kind of “pretending” for long. Here’s where we can choose to stay awake or give in to the temptation to go back to being unconscious. Conscious leaders make better innovation leaders — stay calm and be conscious. Adult development and culture transformation are not mysterious black boxes. The solutions are simple but not necessarily easy. They’re not necessarily “hard” either. It depends on and is relative to your current individual and collective readiness levels. Do the deep work and train together to accelerate the transformation. The majority of senior leaders want to expand their level of mental complexity and emotional intelligence so they can lead successfully in today’s business environment. They don’t want to be a prisoner of their biases, nor do they want their organizations to be limited by their collective biases. They want their organizations to break down the silos, be more open, collaborative, creative, curious, engaged, courageous and inclusive. Ironically, though, their own biases make them unaware of the impact that their mindsets and behaviors have on stifling the expanded capabilities of the organization they want to create. It’s a vicious circle. Leaders’ biases keep them trapped in the comfort zone of what they know (knower mindset). Leaders’ biases make them still want to be the ones who have all the power. Leaders’ biases make them think they can keep the power by having all the answers and telling everyone else what to do. Leaders’ biases make them still want to believe that what worked in the past (the old success formula) will work today. Leaders’ biases make them still think they know which sticks and carrots (recognition and rewards) will motivate people to comply with company rules and be motivated to fulfill company goals. Leaders’ biases still make them think they can command and control their way through complexity and culture change. Decade after decade, despite the irrefutable research on how adults can, in fact, update their mental models, the rock still sits in the middle of the road. It trips us up. We struggle trying to shift from a fixed mindset to a growth mindset. We struggle trying to shift from a victim orientation to a creator orientation. We struggle trying to wake up from being socially defined to self-authoring. Our organizations suffer unnecessarily until serious, permanent damage to the organization itself causes the long-awaited transformational awakening. Until then, most leaders will remain trapped by their (industrial age) biases like zombies/“walkers.” If they are trapped, then we all are trapped. If they are “walkers” (walking around the rock in the road), then we are destined for unnecessary suffering. We will need to choose the deep work of individual and collective transformation in order to be leaders who see our own unconscious bias and try to understand it and mitigate it. The aware but “consciously incompetent” leader, pointing out everyone else’s biases, does us little good. Rewiring our default, industrial age habits for the age we’re entering into will lead us to our “bag of gold.” Today, a business leader’s job isn’t to just be better at responding to volatility, uncertainty, complexity and ambiguity; it is to nurture a more self-led, learning and adaptive environment while facilitating teams of diverse human beings to bring 110 percent of their passion, curiosity, creativity, intelligence, identity and courage to work. Leaders need to be working on elevating mindsets and putting wedges in place that make it impossible to regress to the default (old), counterproductive, less accurate ways of thinking. The ROI is there. A powerful “connecting-the-dots” approach to business benefits will prove to be the only sustainable, proactive cure for these “walking dead.” And only a few of the best culture transformation programs — as well as gender, diversity and inclusion programs — have proven to be successful at facilitating the powerful mindset shifts (e.g., from knower to learner, from fixed to growth, from victim to creator) that lead to individual behavior changes, team behavior changes and organizational behavior changes that then lead to better business outcomes. Who’s responsible for the road to the future at your company? Who’s responsible for digging out the rocks in the road? CEO, the buck (the rock) stops with you. Walking around the rock undermines your winning business strategy. Why would you tolerate that? Digging out the rocks will amplify your winning strategy and the desired results. Let’s not keep walking around the rock in the road. Let’s commit to keep on digging. 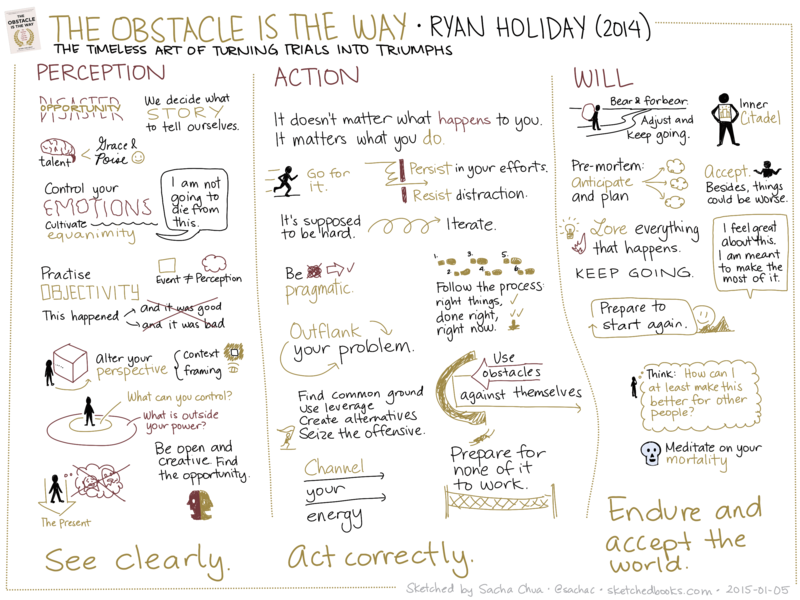 This idea also is represented in the recent book “The Obstacle is the Way,” by Ryan Holiday. In the book, he shares a similar story about a “rock in the road” that blocks a common path of travel for the villagers. Each of the villagers who came upon the rock tried and failed to move the obstacle. Are people undermining your strategy (execution)?